Jeremy Lynch (2015) has published a nice overview of the genetic/genomic tools currently available for Nasonia species. Insects in the order of Hymenoptera are emerging as new genetic and genomic tools for evolutionary biology, development, and behavioral ecology. Among over 115,000 described species in Hymenoptera, wasps, bees, and ants are the major groups. The European Honey Bee (Apis mellifera) is an excellent example of how hymenopteran insects are being used as a genetic model for understanding the evolution of sociality, social behavior, and ecology. Another intriguing example is the parasitoid wasp Nasonia. N. vitripennis has been used as a genetic model since 1967. Recently the genomes of four other species including N. giraulti, N. oneida, N. longicornis, and a sister genus Trichomalopsis sarcophagae were sequenced using a variety of Next Generation Sequencing tools. 5) making fertile and viable hybrids between Nasonia species by Wolbachia infections which is a unique model to understand the hologenome better. 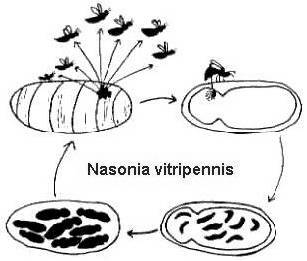 As to the genome features, Nasonia vitripennis has a genome of 332Mb and annotation of 24,000 genes, more than the honey bee genome (236 Mb) and gene numbers (around 13,000). Along with other hymenpterans, the Nasonia genome is hosted in the hymenoptera genome database project (http://hymenopteragenome.org/nasonia/). Several genetic/genomic tools are available for genetic manipulation and functional studies such as TALENs, Zinc Finger Nucleases, CRISPR/Cas9, RNA interference, morpholinos, and germ-line transformation. Additional genetic approaches include interspecies hybrids, visible mutations to help in mapping and stock maintenance, mapping arrays for recombination in hybrids, and segmental introgression lines. One of the notable features of Nasonia’s genome is its DNA methylation system, a similar system is also detected in honey bees and ants (Wang et al., 2013). DNA methylation is one of the most important epigenetic marks involved in genomic regulation such as alternative splicing (Li-Byarlay et al., 2013). There is also a database of methylated regions available for Nasonia species (http://waspatlas.com). These additional resources make Nasonia a robust model system for studies on environmental impacts on genome biology.